Lighten up your favorite pasta with this spicy pomodoro sauce recipe. It's so quick , easy, light and delicious, perfect for a weeknight dinner. Bring a large pot of water to a boil and prepare pasta according to package instructions. In a large saucepan over low heat, warm olive oil, butter, minced garlic and red pepper flakes, stirring to not burn the garlic until butter is melted. Add tomatoes and increase temperature to medium heat. 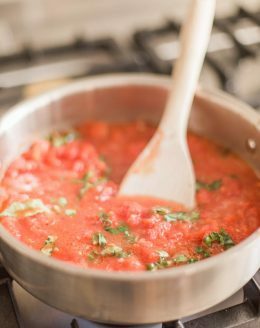 Crush tomatoes with a potato masher or wooden spoon and stir occasionally for 10 minutes or until it reaches desired consistency. Stir in mascarpone, basil and salt and pepper to taste. Remove from heat and stir pasta and arugula. Garnish with parmesan to serve. You can increase or reduce red pepper flakes to adjust spiciness.